Under Sustainable Development Goal target 3.4, governments have committed to reduce deaths from NCDs by one third by 2030, to prevent people from dying too young. 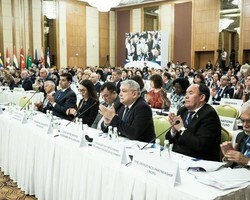 The actions countries can take to achieve this target were the focus of the conference, attended by 44 countries from across the Region. “We’re talking about the lives of people who are being exposed to real risk factors and suffering from real disease, disability and early death, so we must do more. This is about societal and economic development that is being hindered by NCDs,” said Dr Bente Mikkelsen, Director of the Division of Noncommunicable Diseases and Promoting Health through the Life-course, WHO/Europe. If the Region is to reach its target of reducing premature deaths from NCDs, it will be essential to reduce cancers, cardiovascular disease, diabetes and chronic respiratory diseases. The WHO “Best Buys”, a set of policy interventions focused on lowering the rate of NCDs, are known to be effective and include measures to help curb the consumption of alcohol and tobacco, reduce salt and sugar intake, eliminate trans fats in food and promote physical activity. In addition to taking strong action to address the major risk factors, reaching key targets will also necessitate new approaches and forms of collaboration. Indeed, health and social protection systems have played an essential role in addressing NCDs through an inclusive life-course approach, but more can be done. Adding air pollution and mental health to the 4 NCD risk factors and 4 diseases usually highlighted brings new opportunities and opens the door for new partnerships. Looking at these opportunities through the lens of gender, health literacy and migration further broadens the scope for taking effective action. Air pollution automatically brings new partners from across environment, transport and planning sectors, while mental health offers a very tangible way to rethink our approach to health systems. Emphasizing mental health also encourages stakeholders to consider more holistic concepts of health and to deepen their understanding of other determinants of mental illness, such as social determinants. One of the most complex and challenging areas of collaboration for Member States to consider is working with the private sector and industry. While this may present opportunities, Member States will need to work together to safeguard against conflicts of interest when setting agendas and policies.